Hey dolls! I finally have photos for you of the second half of the KBShimmer Spring 2014 collection (see part 1 here). It took me a while to edit these photos because I’ve been spending a lot of my free time working on a manuscript for a journal submission. Oh the life of an academic! The second half I’m showing today includes seven cremes and one crelly glitter. 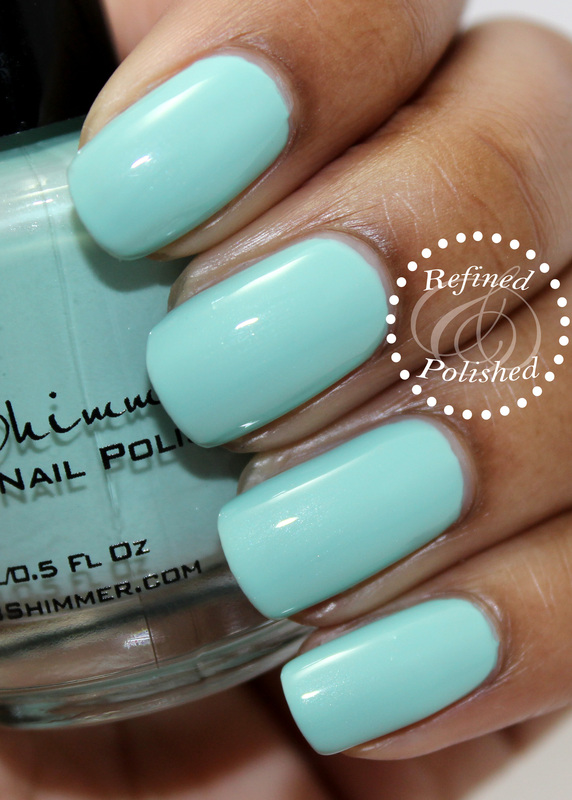 KBShimmer A Touch of Glass is a mint creme filled with very subtle shimmer. I actually didn’t realize this shade had shimmer until I started applying it. The color is absolutely gorgeous! The formula was thinner than the others in this collection, but not runny or problematic. A Touch of Glass was still slightly streaky at two coats, so three were used in the photos below. KBShimmer Eclipse is a jet black creme. The formula was nicely pigmented and was opaque in two coats. As with all black polishes, try to apply Eclipse as neatly as possible to minimize clean up. KBShimmer Honeydew List is a pale green creme. I absolutely love this polish and I wore it for several days. In my sorority, the spouses are called “honey do’s” (as in honey, do this…) , so the name of this polish makes me smile. 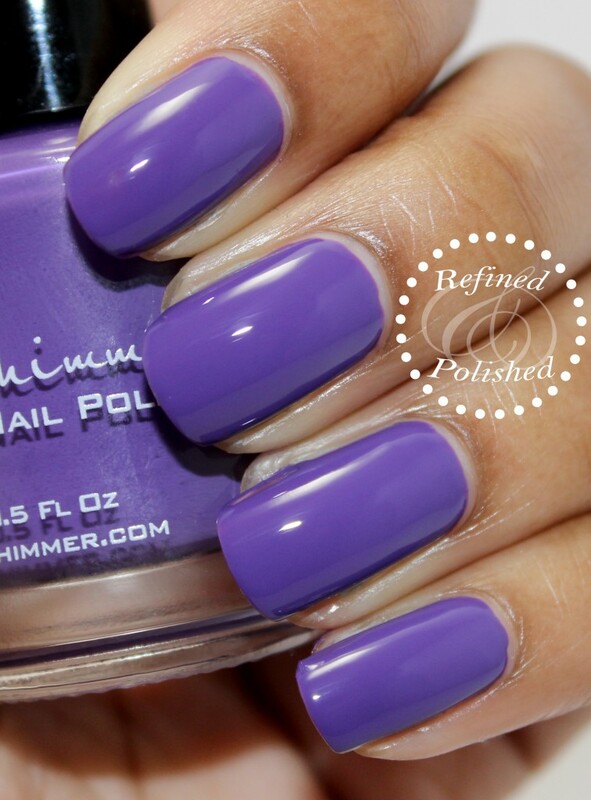 The formula was great and applied effortlessly in two coats. KBShimmer My Life’s Porpoise is a medium gray creme. The formula was great and applied easily in two coats. 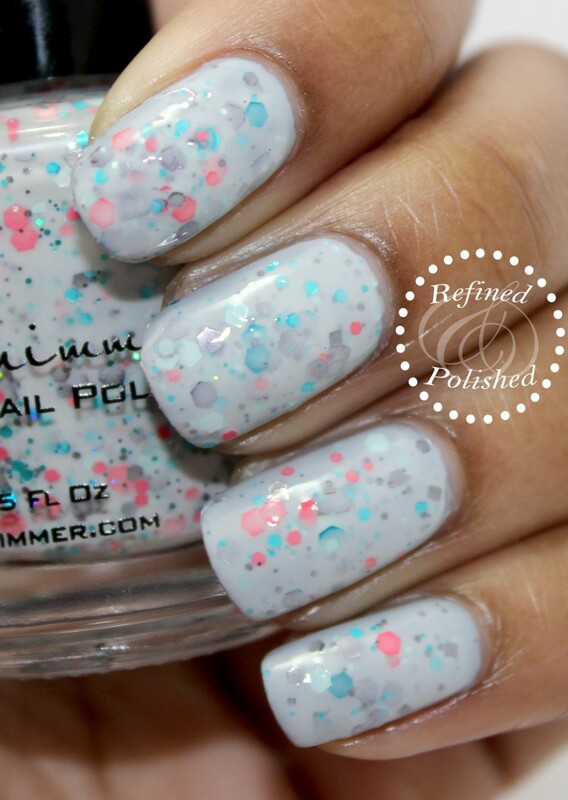 KBShimmer Make My Gray is a gray crelly base filled with coral, turquoise, and gray glitters in various sizes. The formula was good; it self-leveled nicely, the glitters lie flat on the nail, and there was no dragging. Two coats of Make My Gray were applied over My Life’s Porpoise and top coat was used to smooth out the glitters. 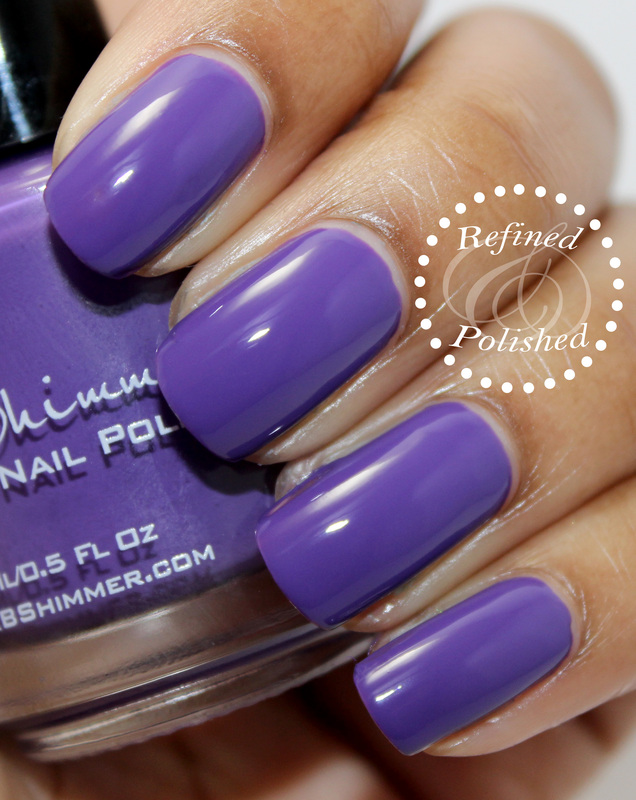 KBShimmer Pansy-Monium is a deep red-toned purple creme. The formula was great and applied nicely in two coats. KBShimmer Sky Jinks is a medium blue creme. This is such a flattering shade of blue. I’ll have to compare it to a few others in my stash. The formula was great and applied evenly in two coats. There was also no staining upon removal. KBShimmer Prism Break is a linear holographic top coat. I like that this top coat doesn’t make the base color appear silver and that it’s not a super holo. 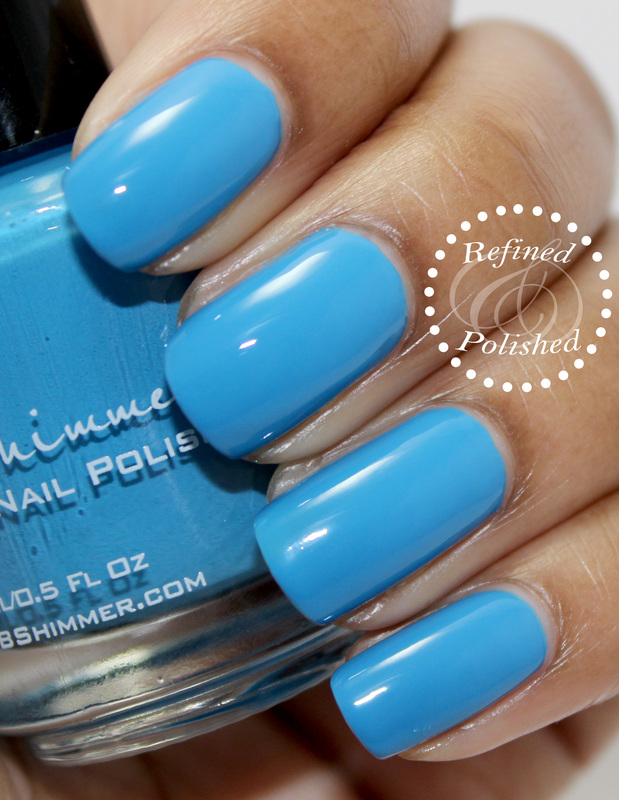 The formula was great and applied evenly in one coat over Sky Jinks. Super holo lovers could use two coats for a stronger effect. I’m really impressed with the cremes for KBShimmer! The colors aren’t extremely unique, but the great formula makes them a worthwhile purchase. Each shade was very pigmented and application was always great. 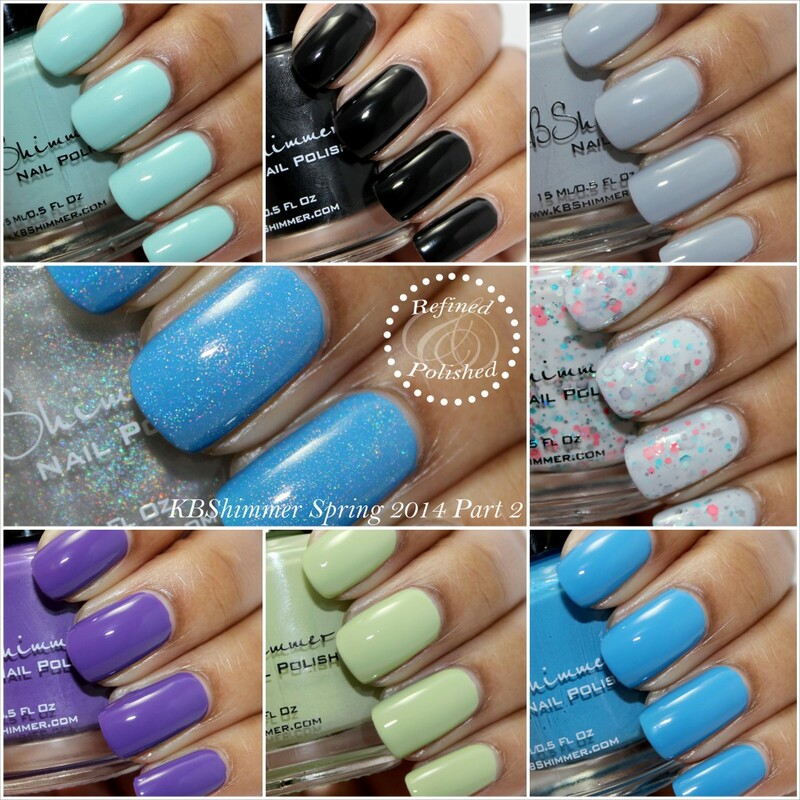 The KBShimmer Spring 2014 Collection can be purchased here where the glitters are $8.75 each and the cremes are $7.50 each. Be sure to keep up with KBShimmer on facebook, instagram, and twitter.